That is why we’ve put together some tips on how to get muddy stains out of your flooring, so you don’t have to panic about getting your shoes dirty this season. 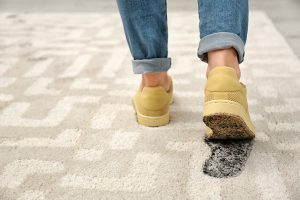 If your dog has just run through your front door with muddy paws, or your children have traipsed through the living room after football practice leaving footprints all over your carpet, it can be easy to panic. However, try to stay calm and steer clear of heavy-duty cleaning solutions just yet. If you attack the stain with other liquids, you could cause it to soak further into the fibres, making it even harder to remove! Instead, it is best to walk away from the stain and leave it to dry entirely. Only once it is dry, you will be able to attack it without spreading it out on to the carpet even more. If you are particularly impatient, why not place a fan in front of the soiled area to making it quicker to dry? The trick to cleaning up mud stains is not to go crazy with sprays, but to vacuum up as much as you can. Check it is completely dry before you start Hoovering and focus on the area with the hose attachment. Even when you have covered the area, it is a good idea to continue repeating to get out the trickiest particles. Pass the vacuum at least 16 times over the stain until you are confident you have sucked up as much dry dirt as you can. If the stain has not lifted entirely, it is time to use a solution but do not go too strong on this, as it could end up discolouring your flooring. Simply mix a small amount of washing-up liquid or laundry detergent with lukewarm water, and use a white cloth to blot on to the mark. Continue blotting until the stain has lifted entirely, and use a dry cloth to see if there is any more mud to come off. 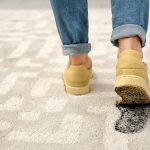 If the blemish is really horrendous, and no amount of patient blotting is helping to get rid of it, it may be time to call a professional carpet cleaner in Liverpool who will be able to sort the job for you and leave you with carpets that look as good as new. This entry was posted in Advice and tagged Carpet cleaners Liverpool. Bookmark the permalink.